A $2.1 million project to control flooding in the Lake Charlene neighborhood appears to have come back from the dead after the homeowners' association reversed its position. 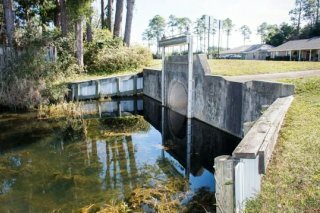 The Lake Charlene Homeowners Association on Monday voted to approve Escambia County's flood project and to offer the county an easement to replace the flood gate that controls the water level of the artificial lake with a weir, allowing water to flow out of the lake faster. In January, Escambia County Commissioner Doug Underhill proposed using eminent domain to take ownership of the small piece of property that controls the level of Lake Charlene. But without support from the other four commissioners, that proposal died, and Underhill said the project was dead until the HOA changed its mind. The idea of granting an easement — essentially giving the county permission to use the private property for the project — was floated at the January meeting, but at the time, the HOA wouldn't agree to the change in the lake's level. The project, which is being funded by a Federal Emergency Management Agency grant, would reduce flooding potential to almost 300 homes and protect 75 homes during a 100-year flood event. The trade-off is the current level of the lake will drop by 9 inches. The county also received a federal grant for $314,274 to fund the design of the project, and the designs have been complete since July 2018. Escambia County is looking to take control of this flood gate along Lake Joanne Drive in Pensacola. The flood gate controls the water levels in Lakes Charlene and Joanne. Underhill sent a letter Monday to Lake Charlene residents urging them to get their HOA or the county to change its position. He began his letter by telling residents he had failed to fix the flooding issues in Lake Charlene. "I have failed for one reason only — your HOA has taken the extreme and unprecedented position of hiring a lawyer to prevent the project from happening," Underhill wrote. The HOA hired Will Dunaway with the Clark Partington law firm to represent it as the county made multiple offers to buy the small piece of land. Bernie Vanosdall, president of the Lake Charlene Homeowners Association, told the News Journal that the association has been trying to get the best possible project done for the neighborhood. "Commissioner Underhill has been strong-arming his way through this whole project," Vanosdall said. "We've tried for almost five years now to work with him to try and get with him the best possible project done to try to minimize any potential flooding in the future. And he has ramrodded the FEMA project that was pursued before he took office without consideration to the people that will flood in spite of it." At a January meeting, Underhill pushed to make a final offer of $21,000 for the 0.11-acre property — 150 percent higher than the appraised value — and if the HOA rejected it, to use eminent domain to take the property. None of the other commissioners were willing to support the idea, and Underhill's proposal died. "Failure means 75 homes in your community remain at risk," Underhill wrote in his letter. "Failure means that the next time these homes flood, we have only ourselves to blame. That is not the Escambia County I believe in which we live." Allen Vinson, an engineer with HDR Inc., the engineering company hired by the county for the project, sent an email sent to the Public Works Director Joy Jones on Tuesday saying he had been contacted by the HOA and they had voted to approve the project. The News Journal obtained the email through a public records request. Vinson said in the email that the HOA was willing to grant an easement with conditions. Escambia County spokeswoman Joy Tsubooka said the county is waiting to receive written communications from the HOA on what conditions they want on the easement. Vanosdall said the HOA is still drafting a letter with those conditions, but said they will essentially come down to the county agreeing to take responsibility for what it does on the property. While the HOA has previously been reluctant to grant the easement, Vanosdall said Underhill's push — which he referred to as "propaganda" — sparked a renewed interest in the project and prompted a different group of residents than usual to attend the HOA meeting. He said that's why the HOA ultimately voted to grant the easement in a close vote. "There are a number of my neighbors who don't care what gets done," Vanosdall said. "They want anything to be done, and many of those people showed up at our meeting (Monday)." Underhill said he believes the opposition from the HOA leadership is motivated by politics as some of the neighborhood board members were supporters of his opponents in the 2014 and 2018 elections. "On the one hand, it's exciting that we're actually going to move forward with the project," Underhill told the News Journal. "On the other hand, it really does highlight the dirty politics that gets in the way of taking care of the county." Underhill said he hopes the issue will be on the agenda for the County Commission's next meeting on April 4. The grant requires that the project be completed by March 2020 or the county will lose the funding. "We have no time to lose," Underhill said. "It's already going to be a difficult thing to complete this project within the grant period."